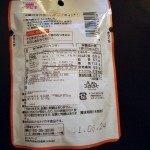 Review: Ichibiki Otsumami – 3 Varieties | Oyatsu Break! I’m really enjoying the seasonal, warm-weather “beer snacks”, salty snacks meant to be enjoyed with a beer (or two, or three). On my August trip toNew York, the JAS Supermarket, a Japanese Import Market, had these three snacks on clearance while I was visiting, and so I had to pick them up. And since this evening my good friend Shane Bennett came over to have a beer while we cleaned the apartment, I figured I should break out the beer snacks and do something of a group review. I should note that Shane has spent a bunch of time in Japan, including a stint as a bartender. He knows his beer snacks, so I was really excited to get his impressions. 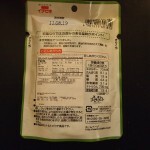 Packaging: It’s a little hilarious, apparently, I realize the extra joy in having someone who can translate the packaging around. Can’t stop snacking flavour, what a treat! The packaging is foil pouches, although unlike the ostensibly higher-end Pretz, it isn’t re-sealable (despite the fact that there are apparently two servings in a pouch). 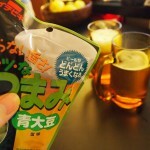 The package has a big glass of beer on it, and big letters that says ‘Otsumami!’ or “honourable light snack” (similar to Oyatsu). 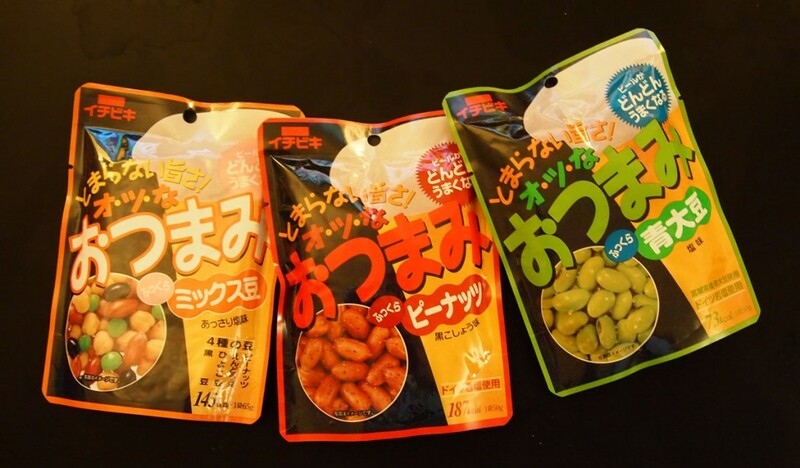 There’s also what looks like a photo of the contents on the outside, depicting edamame, spicy peanuts, and a mix of different nuts and beans. All of the photos have the same text along the bottom though and I ask Shane what it means. Ah, pictures can be deceiving. Scent: We cracked open the edamame ones first and, in my mind, I kind of assumed they were dried wasabi peas, something like that. Opening the package we quickly discovered that, these unrefrigerated packages I picked up two weeks ago are actually edamame. Boiled edamame. Soft. And they smelled like boiled edamame. It was very disconcerting. Cracking open the other two packages, we found that they were also… soft. And smelled like nuts, beans, and legumes, that’d all been boiled about an hour or so ago, give or take. The boiled peanuts smelled strongly of the black pepper seasoning as well, but seeing as they were coated in it, that’s not surprising. 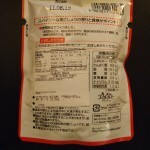 I’m going to be honest… the edamame bag did not smell good. It smelled like boiled edamame, deeply boiled. Those were also the ones that were two days after the best before, and I almost backed out of tasting them. But it’s been about 2 hours now and I haven’t died yet, so it looks like we just squeaked under the wire of freshness. Taste: Both Shane and my husband Andrew looked to me to try the snacks first, and so I dove in with what I thought would be the worst one first, the edamame. It’s like eating Edamame! Without the shells of course, just the beans. Moist beans, actually, which was as disturbing as that first whiff of them. 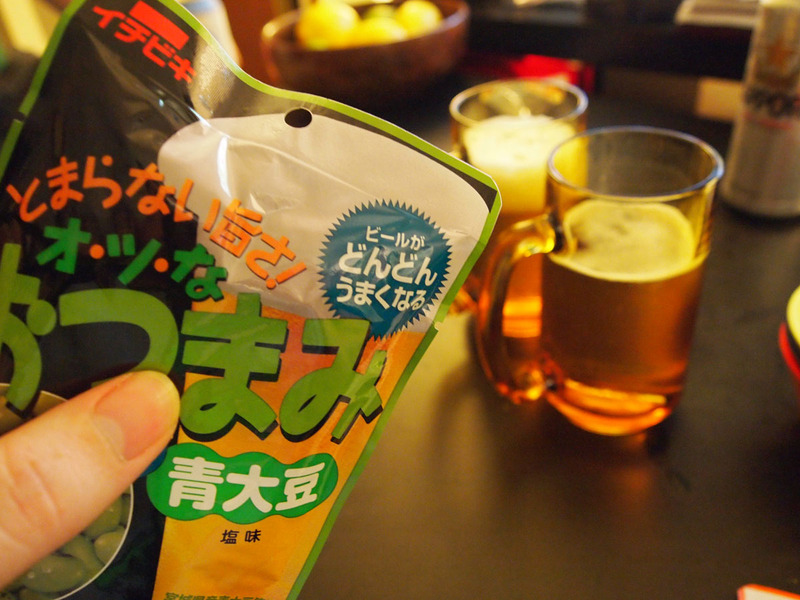 But biting into a handful you get a strong edamame flavour, a lot of saltiness (no visible salt, I should mention, all absorbed) from the salt and MSG (probably lots of MSG), and it really makes you want a beer. 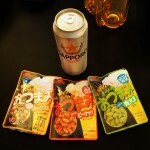 I reached for mine immediately and, sure enough, a light Japanese lager likeSapporoand salty bar snacks go great together! Then we went onto the peanuts, and the boiled peanuts are just a bizarre texture. They still have a peanut taste, though considerably dialled-back from a roasted or even raw peanut. The peanuts are dressed with salt, a ton of black pepper, more MSG, and I actually liked them a lot. Having a couple of handfuls, they coat the inside of your mouth a little and really tasty salty and peppery, they interacted with the beer great. 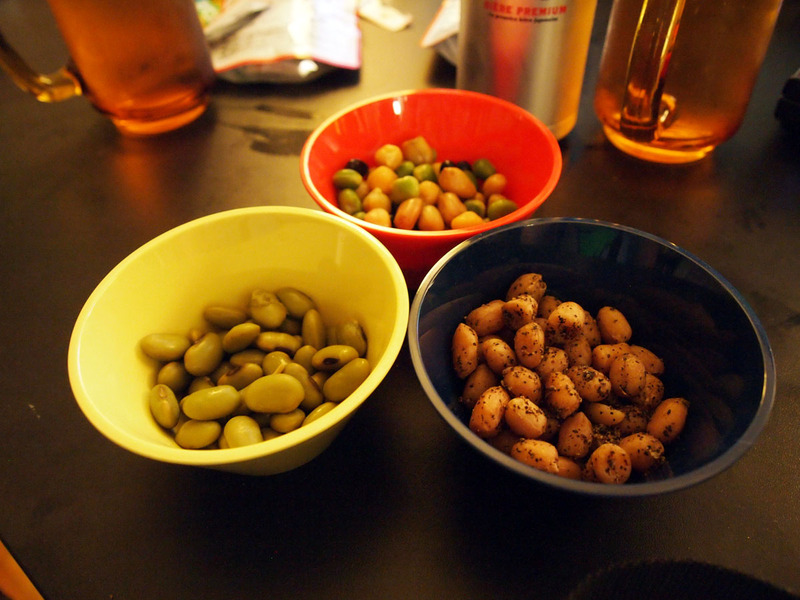 Finally we tried the last package, the mixed beans. 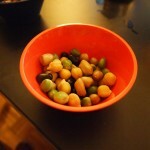 According to the package they contain peanuts, chickpeas, black soybeans, peas, soybeans, salt, msg, and food colouring. The texture is similar to the other two mixes, but with the addition of the chickpeas and the other beans, it’s much heartier. It’s the least-salted, but it’s still quite tasty (possibly because of the residual salt from the others. And the MSG.) I like the flavour quite a bit, and they have a heartiness that would really go well with pounding back beer after beer at a Japanese snack bar. 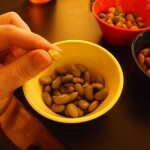 Shane: There’s something unsatisfying about shaking the little bowl of these and not hearing them rattle around. It’s just sort of a dull thud. It’s disappointing. Verdict: These are not your western bar snacks, this is some next-level stuff right here. I think part of the problem is actually a cultural difference. According to Shane, all of the packages say that the snacks are “German style,” or actually “German use,” to be literal, but I’ve never heard of boiled nuts as a bar snack… but then Western (North American especially) bar snacks are kind of pathetic. Coming out of a culture of Puritanism it seems like we demonize drinking more than a little, and the idea of a little snack to go with your beer is basically unheard of unless it’s dried and packaged. Sure you can get wings or a burger at a restaurant that serves beer, but if you just wanna sit at the bar and have a little something Beer nuts and peanuts are the alpha and omega of your options. I’ve walked into bars in Sapporo where they have served me a freshly made salad with my first drink, all in a space that’s about half the size of my apartment. 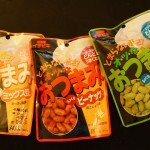 So yeah, approaching a Japanese bar snack in a little foil package and having it be cooked and seasoned beans, legumes, and nuts? I can’t help but feel that part of my reaction to it is just being raised in a different culture, one that’s frankly a little lacking in this area. But in my defence, those edamame really did smell a little funky. They tasted good though, they all did. 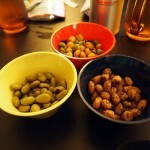 They were super exciting snacks, and I’d definitely try all of them again with my favourite probably being the peanuts. Ichibiki’s Otsunami are real elbows-on-the-bar, come-on-have-another-drink type snacks. I can get behind that. But I’ll let Shane have the last word.